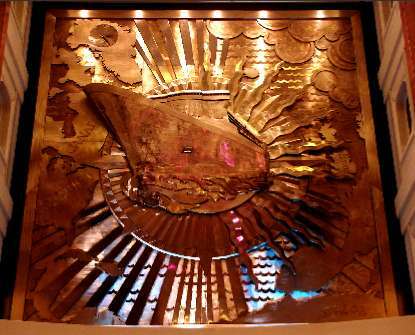 The artwork was created by John McKenna and his assistants in his studio at High McGownston, Ayrshire.The artwork was fabricated in sheet bronze by cutting, bending, and sheet metal work, finally it was welded and assembled by John McKenna. The work took approximately two years to complete, from McKennas' original concept sketches to the final installation on board the ship at the Chantiers d'Atlantique ship yard, Saint Nazaire in France. 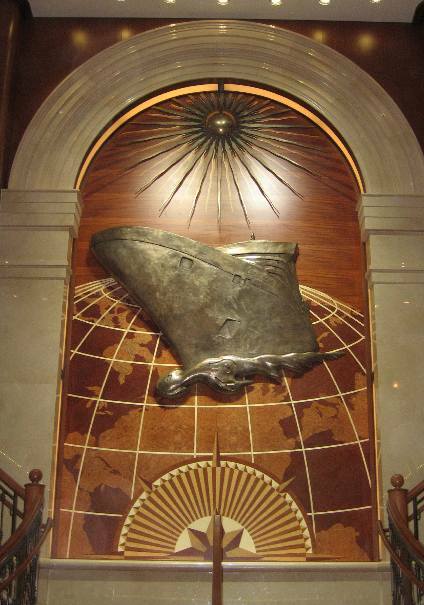 It takes its pride of place in the Grand Lobby Atrium of the new Queen Mary 2 and is one of the biggest artworks on the ship. The sculpture measures 6.5m in width and 7m in height and a depth of relief approximately 30 cm. The bronze sheet measures approx 1mm thickness and was carefully TIG welded onto a stainless steel frame. Below left a sketch design drawing of the bronze panel which is now gracing the Grand Lobby of the new Cunard liner the Queen Mary 2. 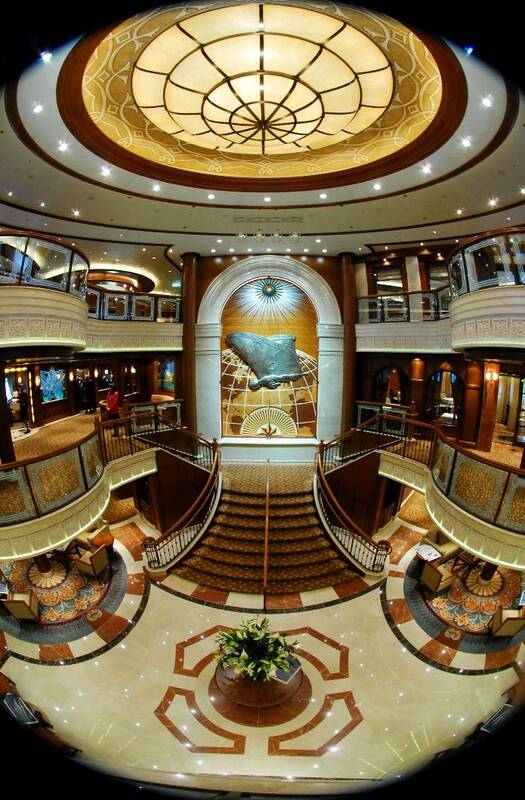 It is the main piece of artwork in the atrium of the ship. This original drawing and a concept maquette were shown to Cunard and the ultimate owner of the shipping line, Micky Arrison - of Carnival, by the art agents Onderneming & Kunst prior to the commissioning of the sculpture. Below right the Queen Mary 2 ship herself lying at Ste. Nazaire shipyard during construction. 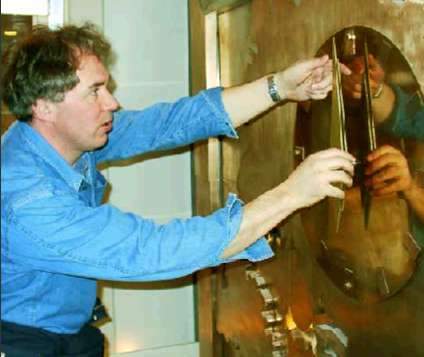 Below Left - John McKenna setting up a pair of clock hands on the top left hand side of the sculpture.The client asked McKenna to make a simple clock which uses the ships technology to automatically update the time as the ship passes through different time zones around the world. The clock although a very simple design was tricky to make. The drive mechanism for the clock was not massive but to make any impact at all on the sculpture the hands had to be as big as possible for the drive. McKenna made the hands in Aluminium and finely balanced them to enable the clock to work properly. These artwork were designed and created by John McKenna and his assistants at his studio at High McGowanston, Ayrshire, Scotland. 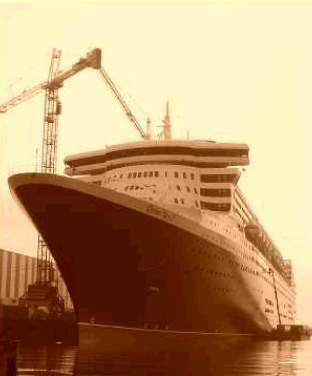 5m by 3m panel created for the grand staircase of the brand new CUNARD liner the Queen Victoria launched in December 2007. 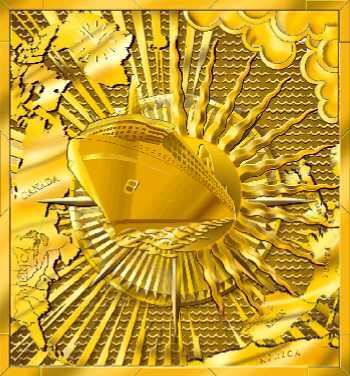 John McKenna was asked by the company to create another signature artwork for the new ship. 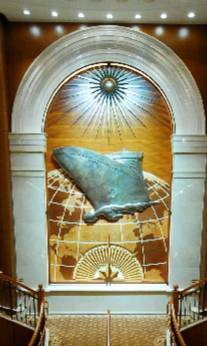 Using a portrait of the ship as the main central feature. John designed by CAD the background to the relief ship to be made in very fine marquetry. This accurate very high quality marquetry was produced to full size by the English company Aryma Ltd. The components of the sculpture were then transported from the studios to the Marghera shipyard outside Venice, Italy were the new ship was built. John McKenna and Howard Sansome of Aryma went onboard to assist in the final installation of the artwork.